Progress is being made for the creation of a Village of McFarland Community Garden, and I harbor high hopes that we will be able to dig in to a beautiful space this spring! A possible site has been established at the green space on Anthony Street in downtown McFarland. This is a plot of gently rolling land that stretches between the McFarland United Church of Christ and The Homestead housing complex. Currently, the proposal and preliminary design have been approved by the McFarland United Church of Christ (owners of property) and the Village of McFarland Parks Department. Next, the proposal will be presented to the Village Board for final approval. Then, we can start the really fun work of turning this dream into a reality! At this point, we need to develop a committee of folks who are interested in designing, implementing and maintaining this Community Garden. I would like to schedule a meeting for people who want to contribute their ideas, skills, and talents so that we can work together to make this project as successful as possible. Please contact me if you are interested in volunteering to be a member of the committee! easy walking distance to a multitude of residential, commercial, and community buildings. Youth Gardens: A portion of the green space will be created as a “Youth Garden Playground,” sponsored by our local McFarland Sparks 4-H Club. This inter-active, growing wonderland will encourage children of all ages to discover the beauty of nature through exploration and education. Structures will be designed with a child’s sense of wonder in mind. Some examples of this area include: a variety of plants that offer a stimulating sensory experience; cozy spaces such as sunflower houses and bean teepees; a “hunt for worms” digging space; a mini-veggie tasting garden; a “Three Sisters” Native American plot; and a pollination station with plantings designed to keep our helper insects happy. We hope to use this garden as an educational experience for the students in McFarland Schools, especially since this plot will be within easy walking distance of both the McFarland Primary and Waubesa Intermediate Campuses. Adaptive Gardens: A section of the community garden has been allocated for specially-designed adaptive structures for our residents with special needs. This area will be located closest to the sidewalks and handicapped parking spaces. The Adaptive Garden will include extra-wide pathways, 3 foot raised garden beds, and vertical gardening trellises, to allow for the easiest access for residents who find traditional gardening methods challenging or cumbersome. 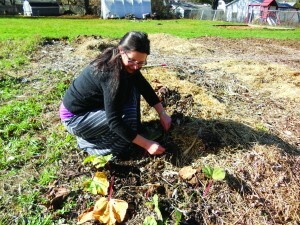 Individual or Family Plots: By far, the largest area of the Community Garden is for individual or family plots. These plots are 20′ by 20′ growing areas that can be reserved for a growing season for a fee. The fee will cover the use of communal tools, water resources, compost, and hay for mulching. During the growing season, plot gardeners can grow a bounty of veggies, fruits and flowers. Low Income Support: We hope to make this project accessible for all families in our community. Plot fees will be assessed on a sliding fee scale. All garden tools and implements will be made available communally for all community gardeners, and stored at a central garden storage shed. Programs are being developed to provide seeds and seedlings at a very low to no cost for the individuals who need them. Additionally, we hope to partner with the McFarland Food Pantry to promote a “Plant a Row for the Hungry” program to generate donations of fresh vegetables to our local food pantry. Garden Steward Program: To make this program successful, we need the whole community to embrace this public growing and meeting space. Therefore, we are developing a Garden Steward Program for our community groups and organizations. Any group can participate in this outreach opportunity by volunteering to “steward” our garden for a week, a month, or a season. This could be to design, plant, and maintain flower borders; clean and maintain tools; build benches; fix fences; etc, etc.